When Plans A, B, and C Don’t Work, it’s Okay to Cry. Then, Try Plans D, E, and F. Then, Hope. 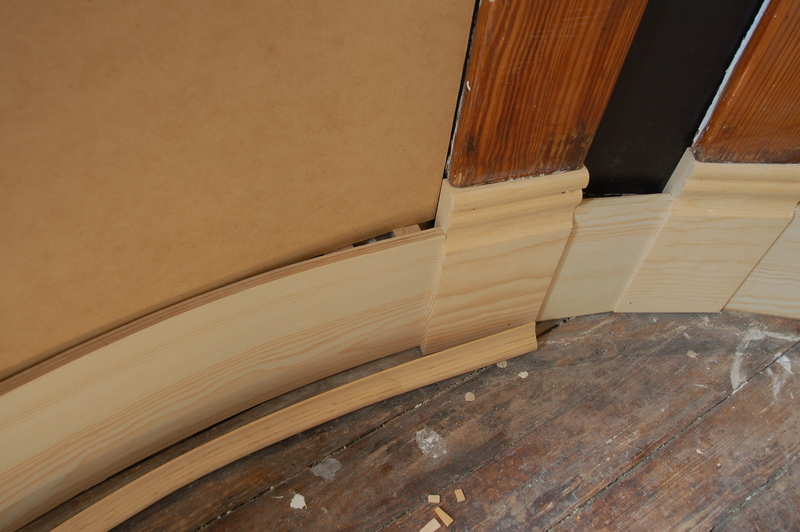 I know this is not new information to anyone who has been following along, but curved woodwork is hard. And I know I wear my frustration on my sleeve. Guess what? It hasn’t really gotten easier. 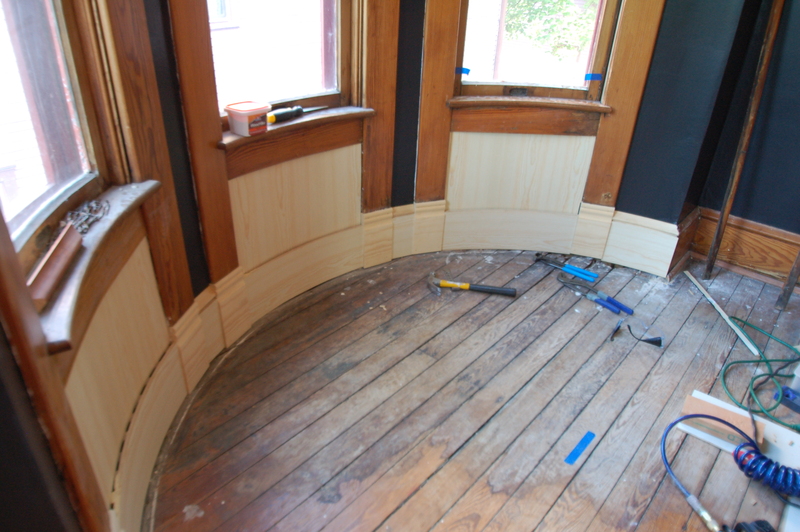 And then, we finally found some major success by using veneer to create the curved baseboards! This was SUCH a great day. That left us with the picture you see below! 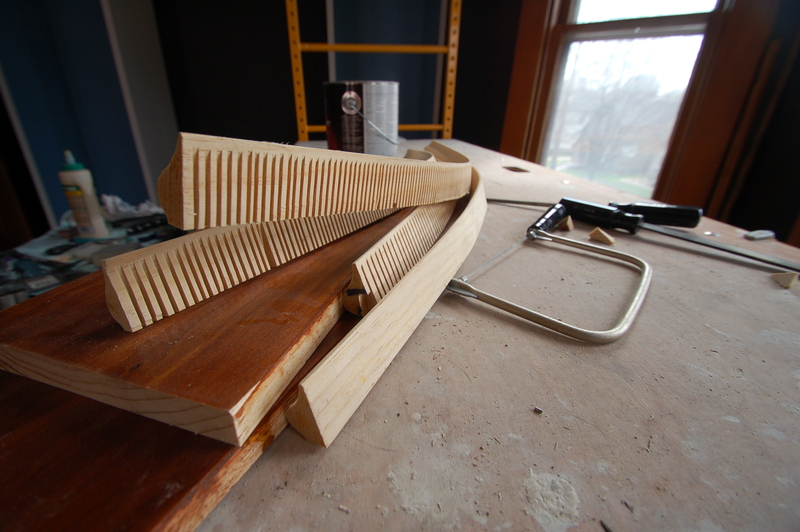 Veneered baseboards, awaiting their crowning glory from the steamboxed cap pieces. While the steambox worked to create a curve, you can see in the picture above that the curve also took the edges of the pieces, and pulled them up. There just wasn’t enough flexibility AT ALL to make the cap pieces work with any sort of happiness from either of us. This next picture, it doesn’t look SO bad. But in real life, it did. 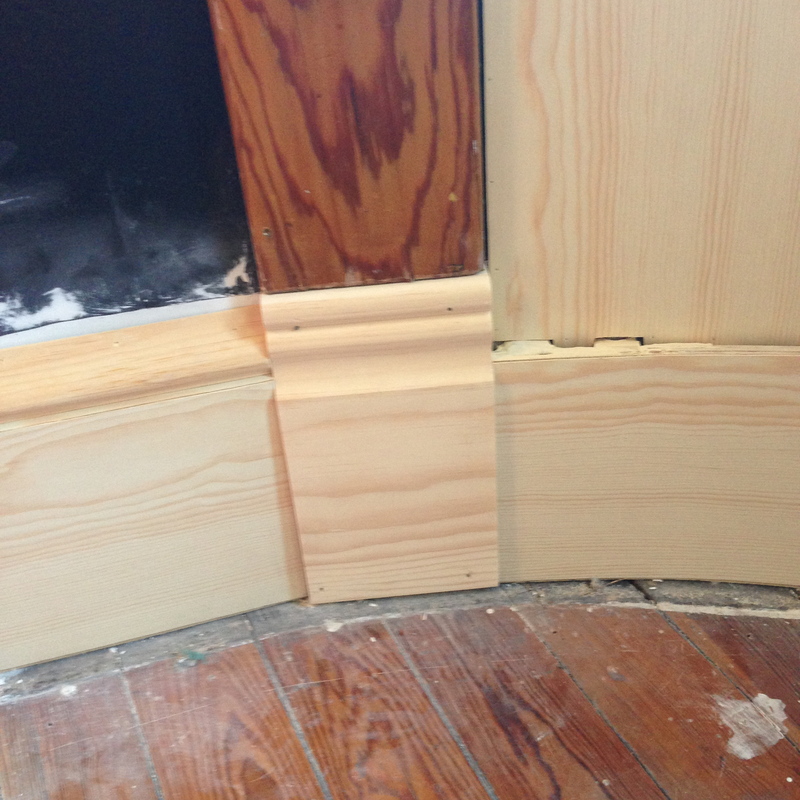 And the gap created by the curving of the edges of the moulding was pretty large, so we tried to diminish it by adding a piece of 1/8″ MDF behind it. I mean, it KIND OF helped. But not enough. I was in tears at this point, because we have wasted SO MUCH TIME on things that haven’t worked. It’s maddening. 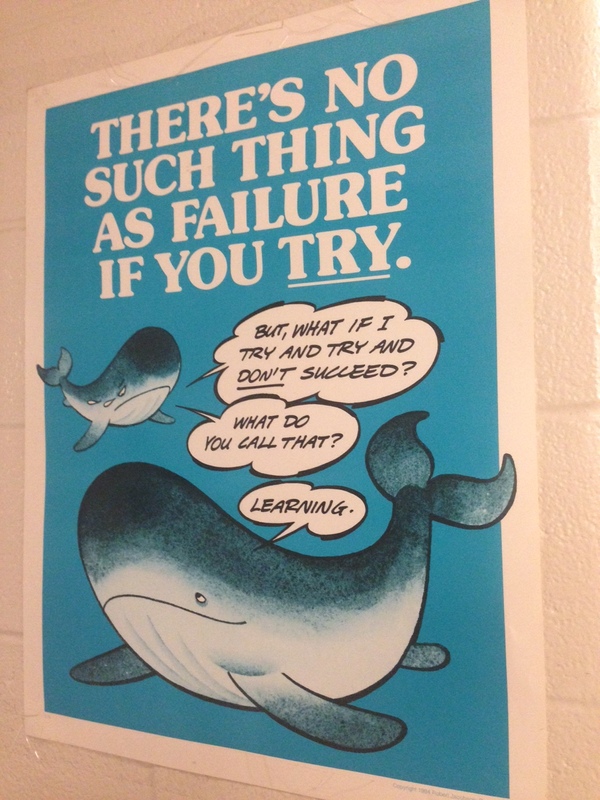 I know that each time we failed, we figured out a different path to take, and that is a GOOD thing. But the path I wanted to take was to get the bedroom to the point of putting a bed in it. Because frankly, I could use a nap. See the gaps along the top edge of the cap moulding? Not quite acceptable. So, we did what we do best. We stared at the problem, ate some good food, got some sleep, until we found a solution. And that solution was one floor down, still in the turret, but in the first floor Entrance Hall. 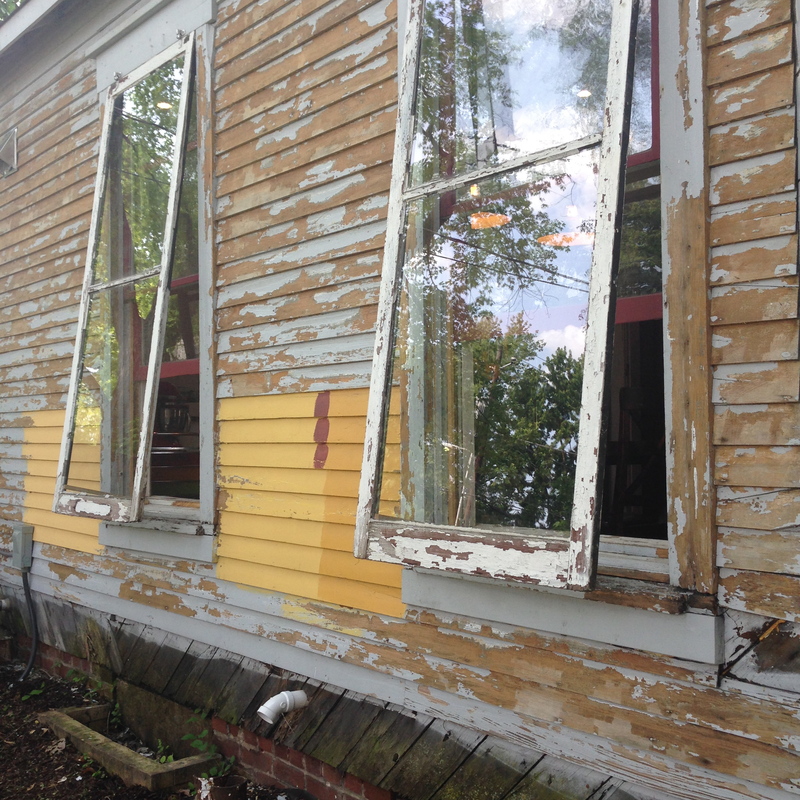 Check it out: here, the area under the windows is paneled, not plastered. 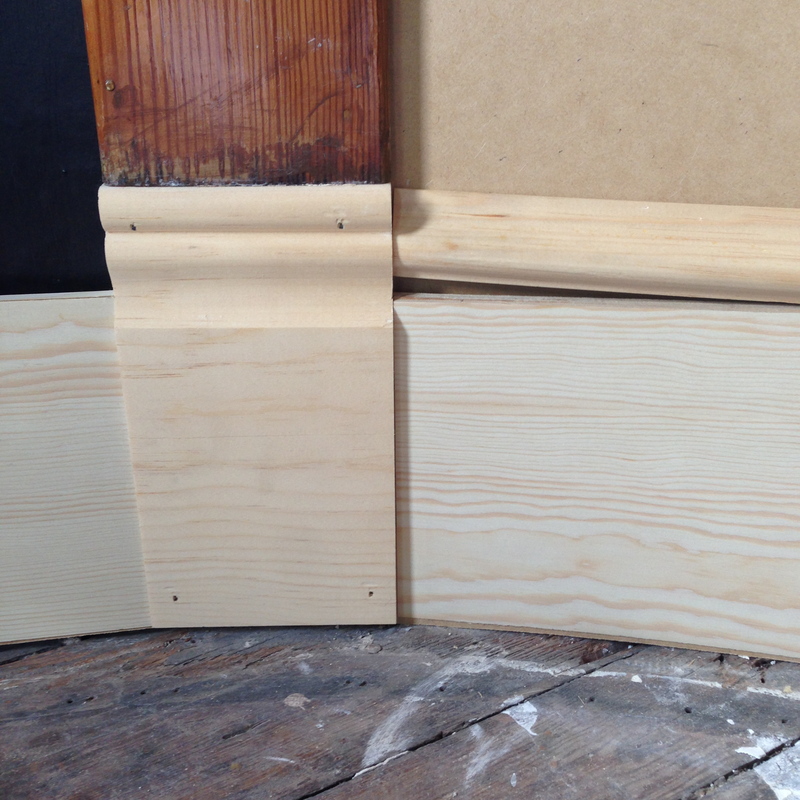 Also, they don’t have the cap moulding on the baseboard – the cap moulding only exists in the areas between the windows. And these areas are not as wide, and don’t require such a curve over a long span. Also, that HVAC register is awful. I know. I’m sorry. One thing at a time. 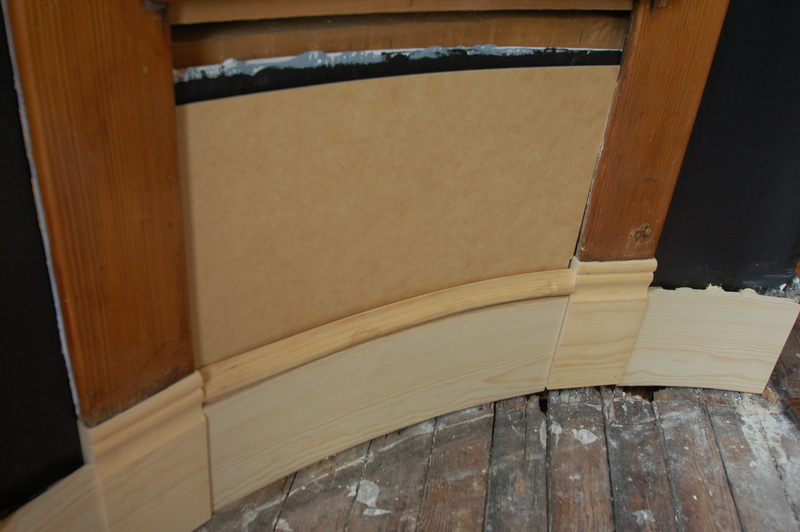 Continue to find a way to work with our steamboxed cap mouldings, and work with them to keep trying to make them more pliable, and to find success with the curve. 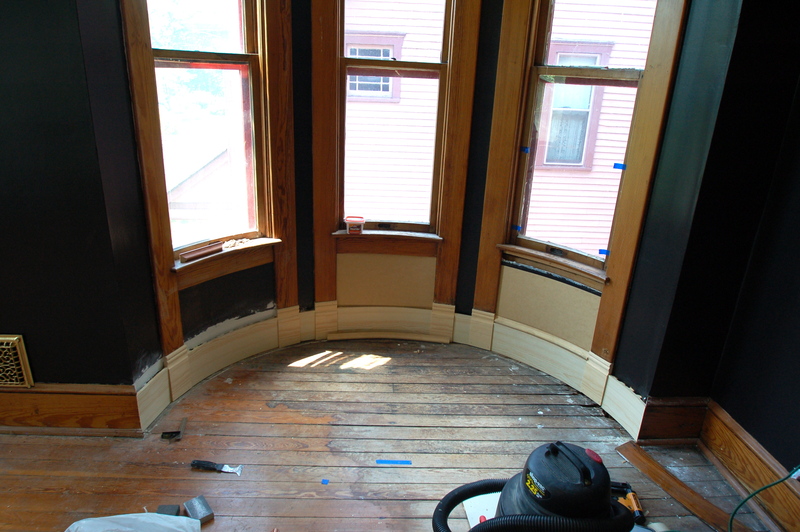 Or, we could try and mimic the woodwork from the turret in the first floor by using paneling. On the first floor, 13 out of 17 windows have the paneling. 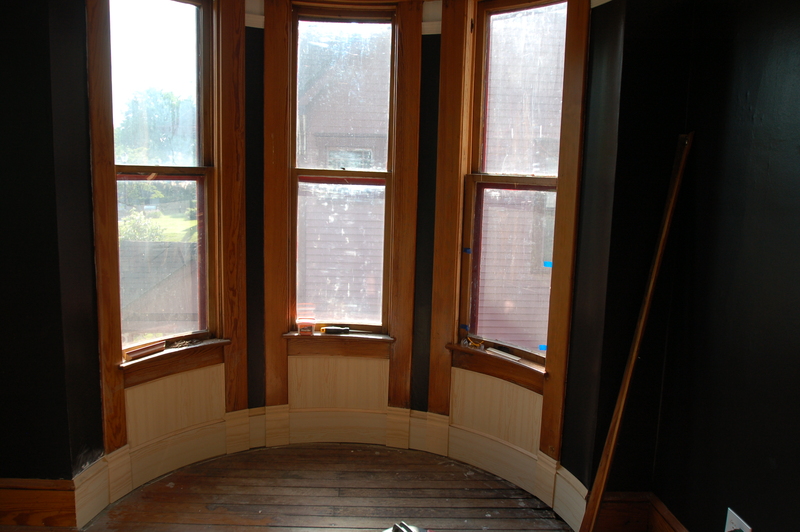 On the second floor, NONE of the windows have the paneling – it’s all painted plaster. 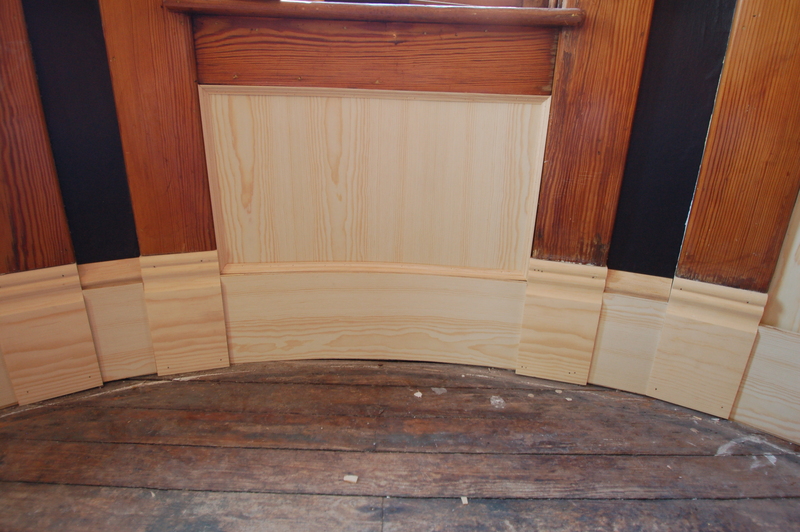 By choosing the paneling option, we would be doing a departure from the rest of the second floor (and we wouldn’t really honoring the original intent of the woodwork). 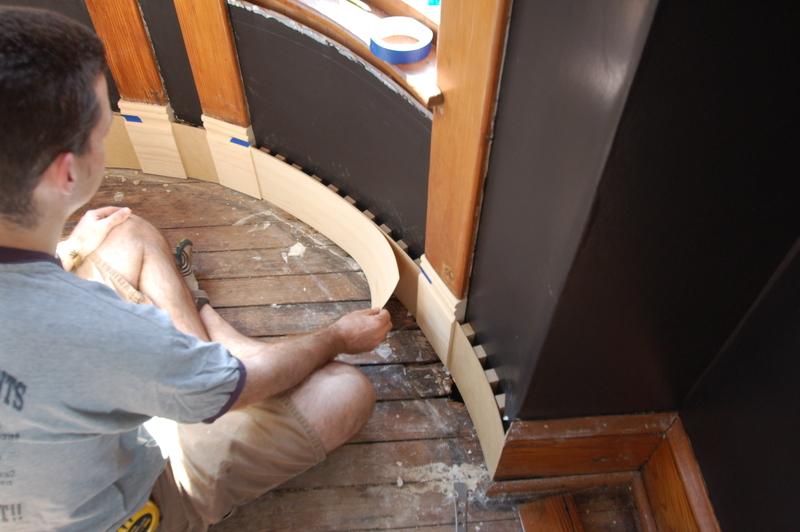 On the other hand, we’ve been working on the woodwork in this turret for a couple of months, all paths we have traveled have been dead ends (or cliffs of insanity), it’s been frustrating, and not fun. Decision made. 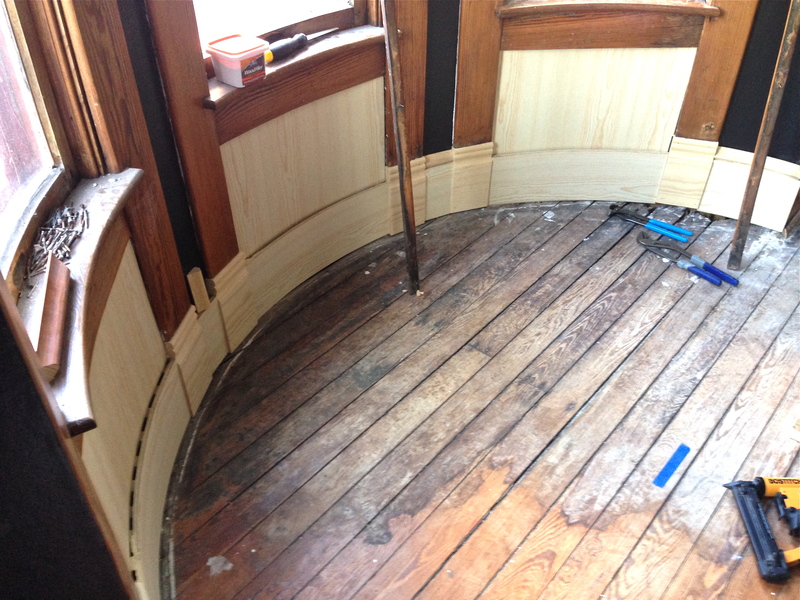 We’re going to panel, and keep the turret woodwork consistent from floor to floor. 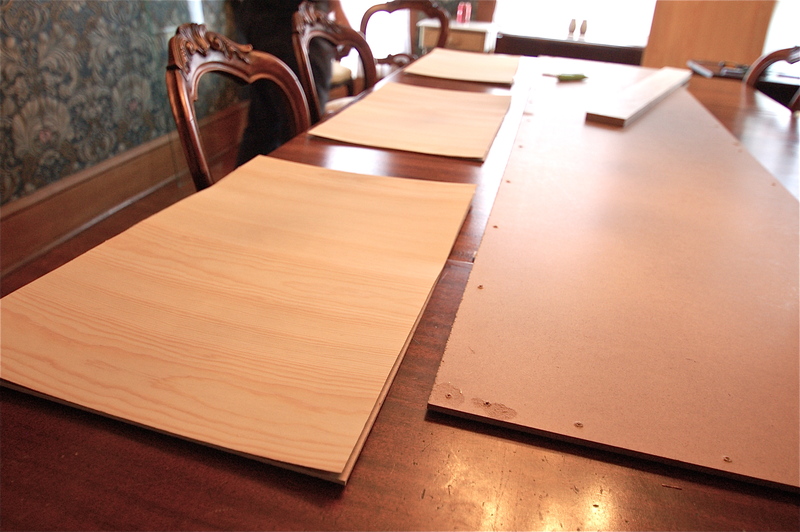 We cut out 1/8″ MDF for each panel, and then used leftover baseboard veneer to face the front of it. The panels went in really smoothly. Hooray! And, just like we were hoping, the smaller sections of the steamboxed cap pieces worked PERFECTLY in the in-between areas. That was nice. 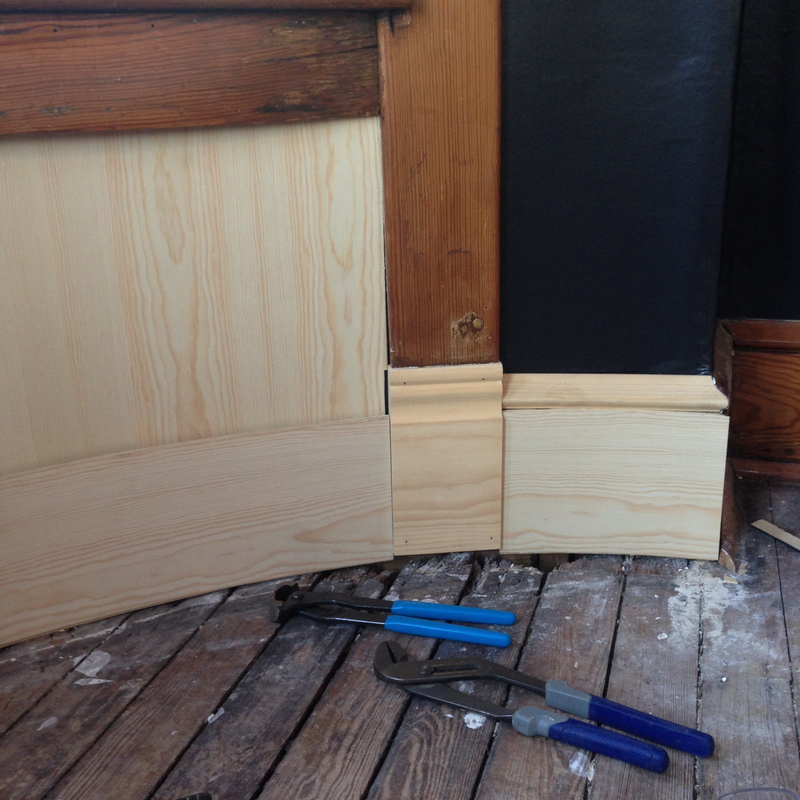 So now, we needed to add some moulding to the rough edges of the paneling, like picture frame moulding. 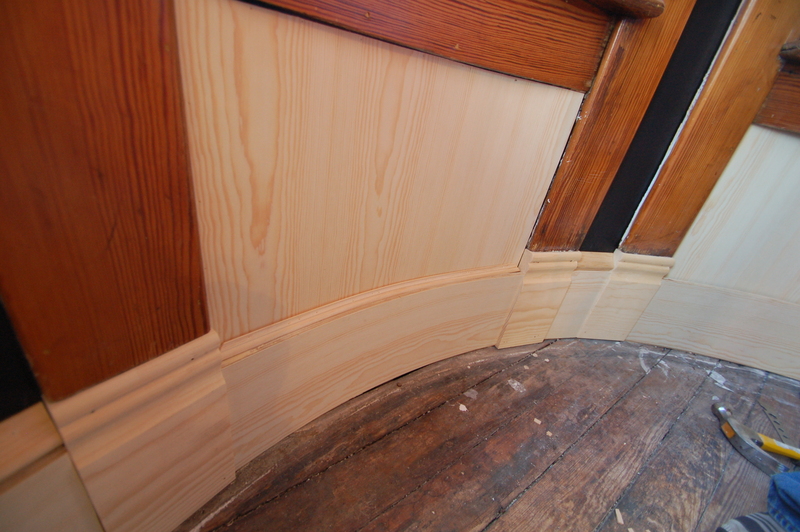 This would finish off the woodwork, and make it look like the woodwork on the first floor. 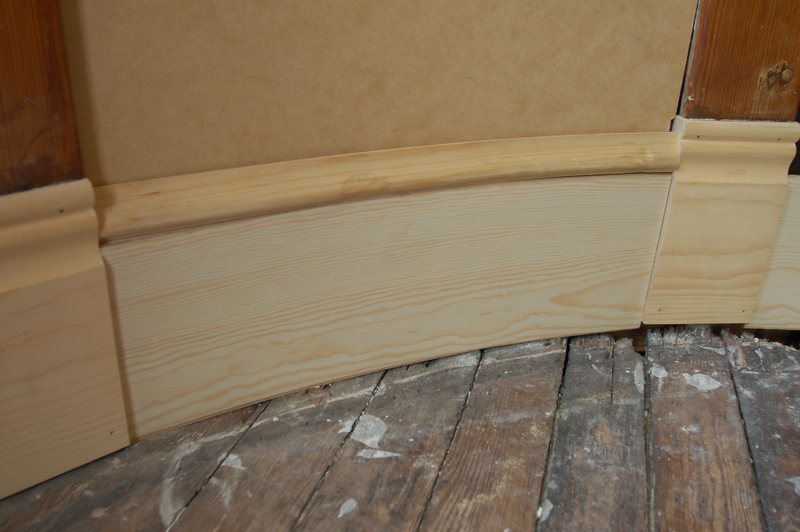 You can see the first piece of the picture frame moulding here, on at the bottom of the panel, on top of the baseboard. One complete panel done! This really looks nice, and I started to be excited again! It’s not what I envisioned when we started this, and that’s always hard. But I think it looks great, and I’m excited to get it stained. Nervous to match the colors of the existing wood, but mostly excited! I think the best past of the weekend was when we were finishing this up, and I brought a piece of stained glass in the room to hold it up and see how it looked in the space. Doug said, “Wait a minute – we’re not even close to being ready for the pretty stuff yet.” And while he’s totally right, I felt SO MUCH BETTER hearing him say that. Because it made me recognize that if I am excited to bring the finishing touches in, that means I feel like we’re close. And I feel like we had some success, and that the end is (once again) somewhere in sight. That makes for a MUCH happier Amy. 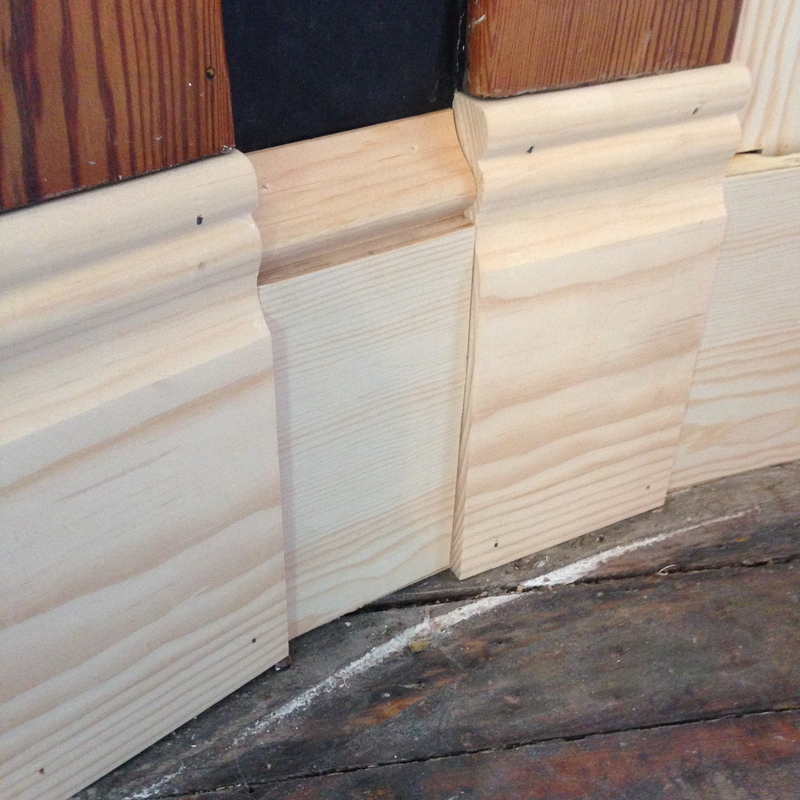 All that’s left to do before staining is the shoe moulding!!! 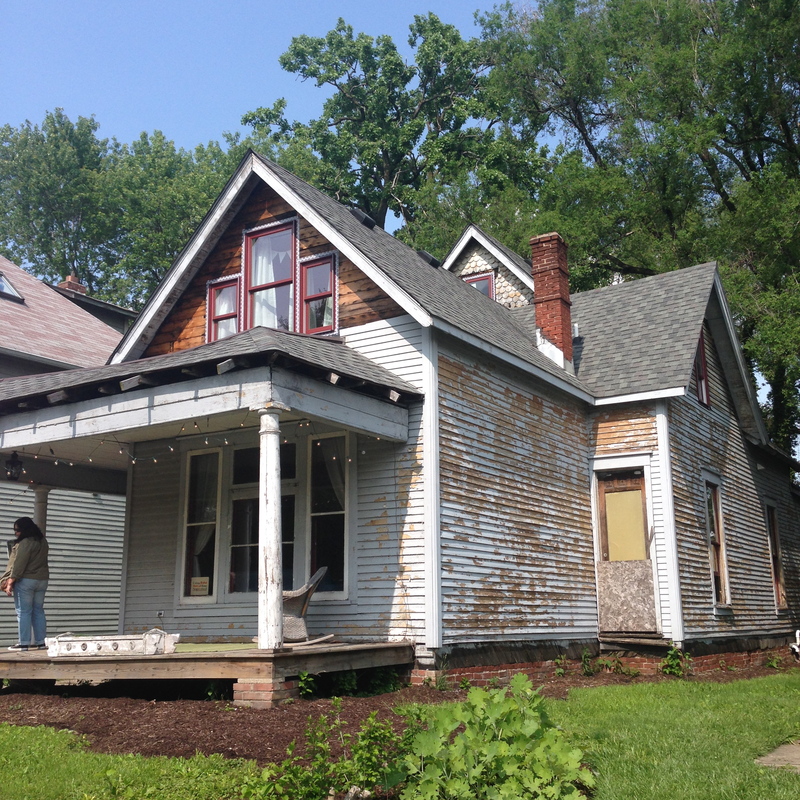 This past weekend we got out of the house, and headed to a home tour for the Cottage Home neighborhood in Indianapolis, just a few minutes away. If you follow me on Instagram, I’ve been posting a lot of pictures from the tour! It is a DELIGHTFUL collection of mostly Victorian Era cottages in a super fun neighborhood that you can tell is very close knit. We went because we love home tours, it’s always rejuvenating to explore other Victorian Homes, and because we think the neighborhood is FANTASTIC. 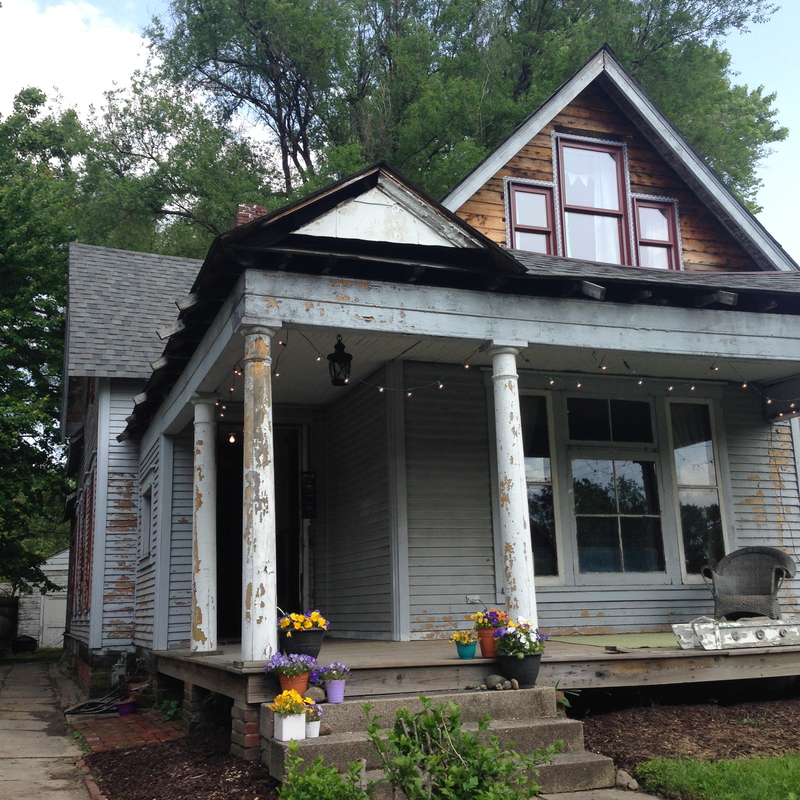 But also, we wanted to see the home of fellow bloggers Joe and Amy. Like me, Joe is also a band director (his wife is also an Amy, and a teacher as well!). I had met Joe in professional circles a couple of times – his school district and mine are side-by-side – but I became enamored with Joe and Amy’s blog over the past year. I was at a band event, and someone heard about my house and said, “I know a band director who blogs about their renovation, you should check it out!” My response was, “Ummmm, that’s me?” Because WHO KNEW that there were two band directors in Indiana who liked to restore houses by themselves in their spare time AND also blog about it? It’s so uncanny and crazy and great. That’s the story of how I found their blog. It’s really such a small, small world. And if you haven’t read Amy & Joe’s blog, start reading NOW (“Under New Management Blog“). You will love them. They are doing so many things that leave me in awe. Here are a few pictures I snapped of their house at the tour this weekend! 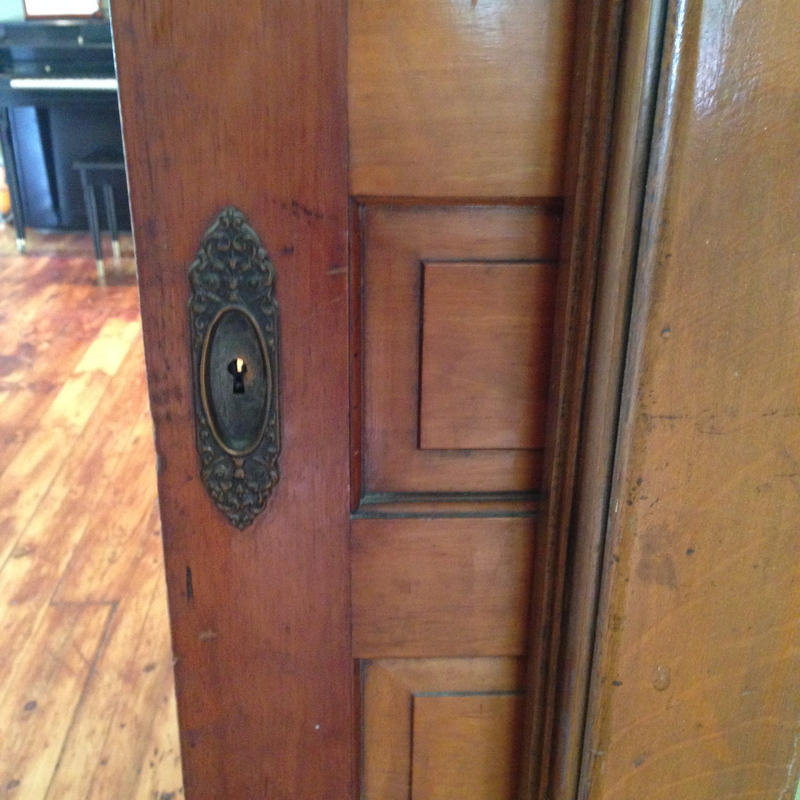 The hardware on their doors is so great! 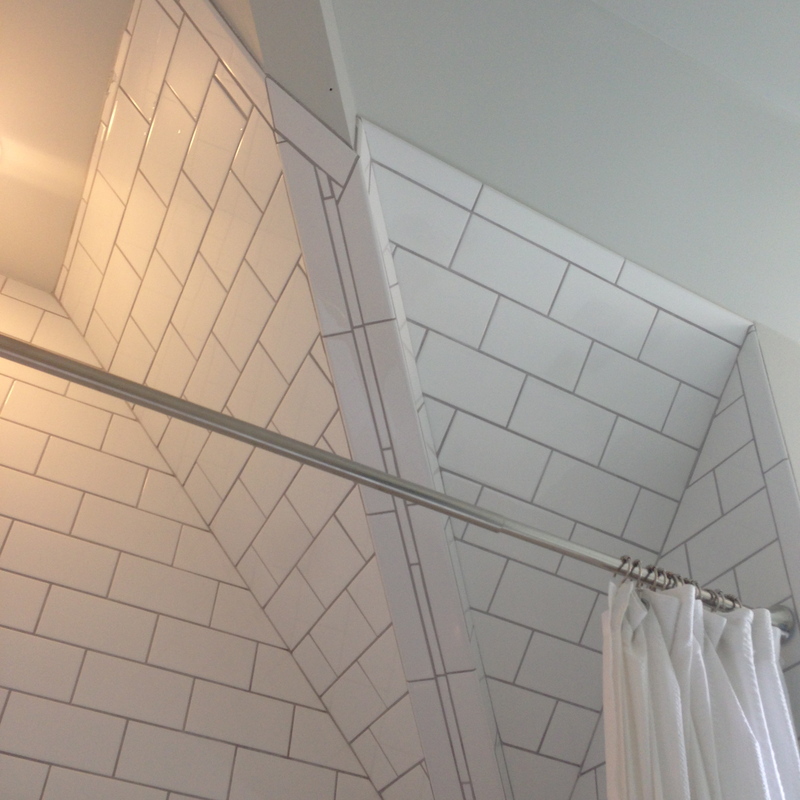 THIS TILED ATTIC DORMER. Oh my word, is this awesome. 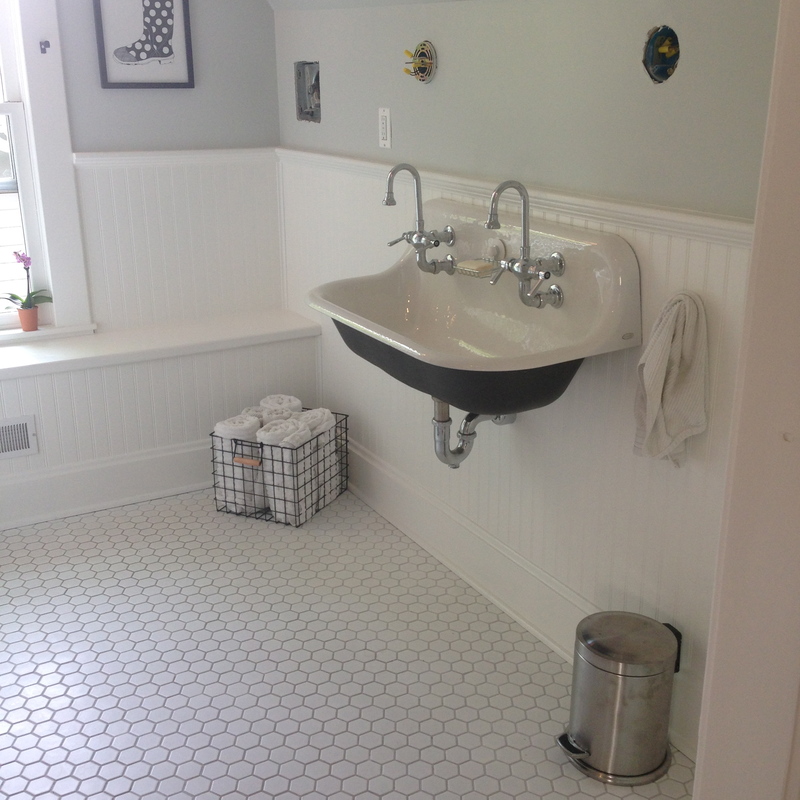 Actually, the whole bath is awesome. 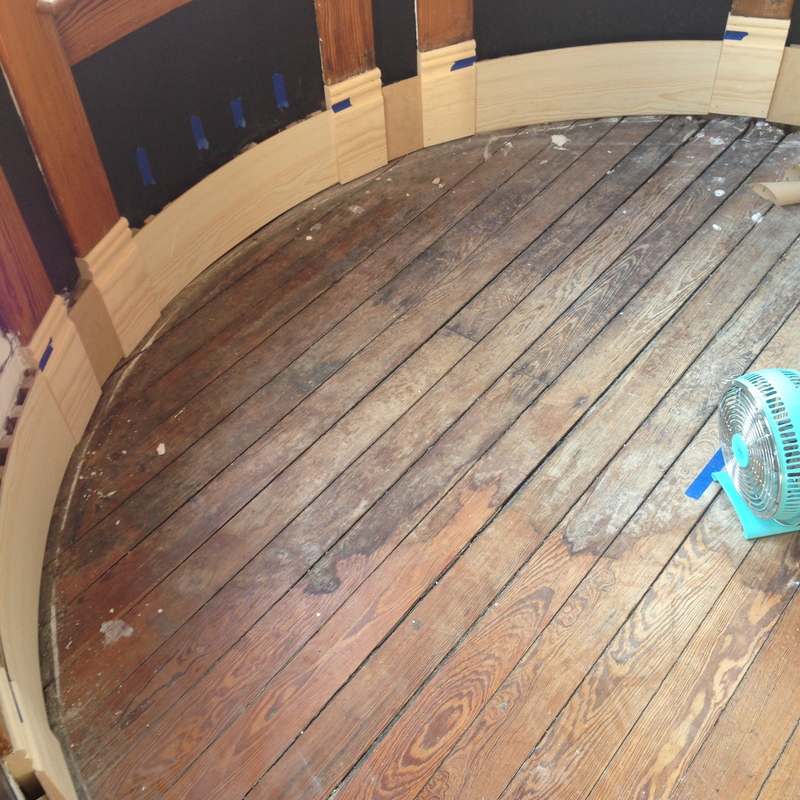 I followed their painstaking process of sanding and refinishing their floors, and I am so glad I saw them in person. 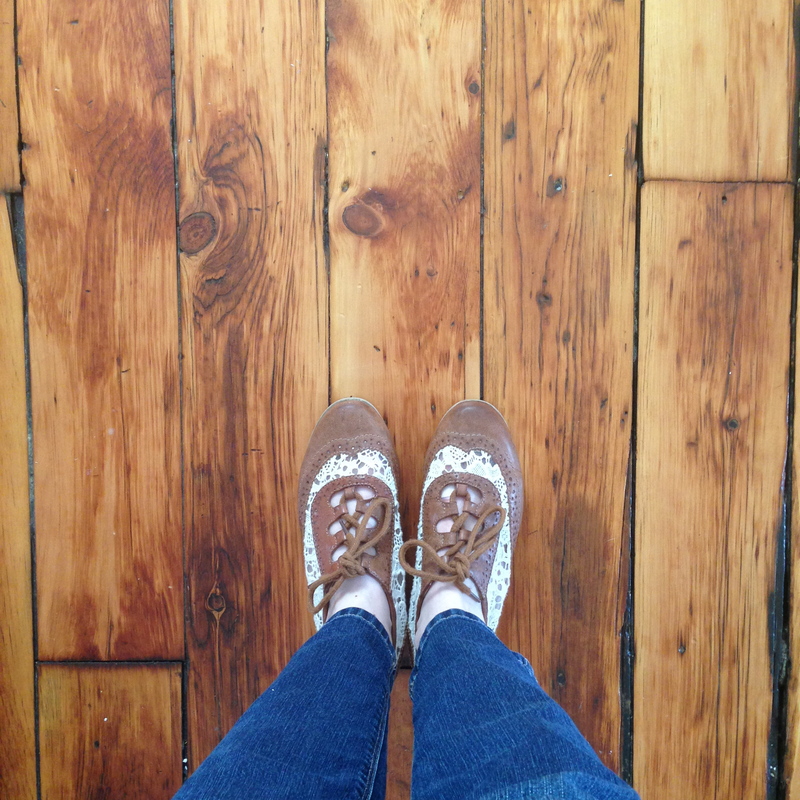 Pictures don’t do these wood floors justice. They are so full of character and life – it’s amazing. It’s going to be a show stopper. Previous PostWe Have a Winner! Its Name is Veneer. 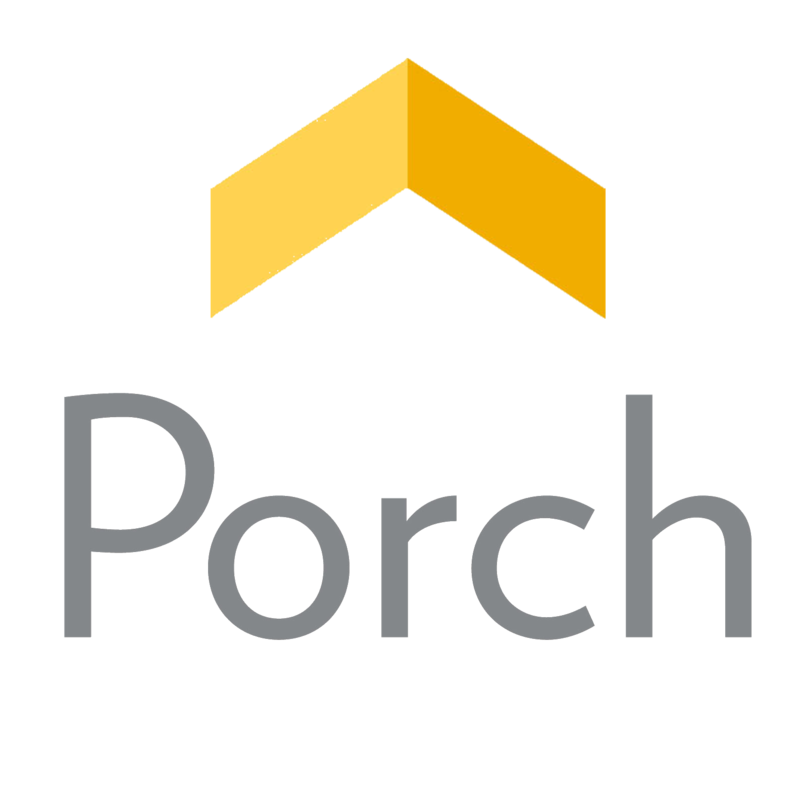 Next PostOld House Journal – June Issue! I can totally relate to the frustration cry and also how difficult it is when it’s not possible to make things exactly the way they look in your head. Luckily things have been going my way lately. Keep your chin up…you’ll get there! Off to check out Joe and Amy’s blog. 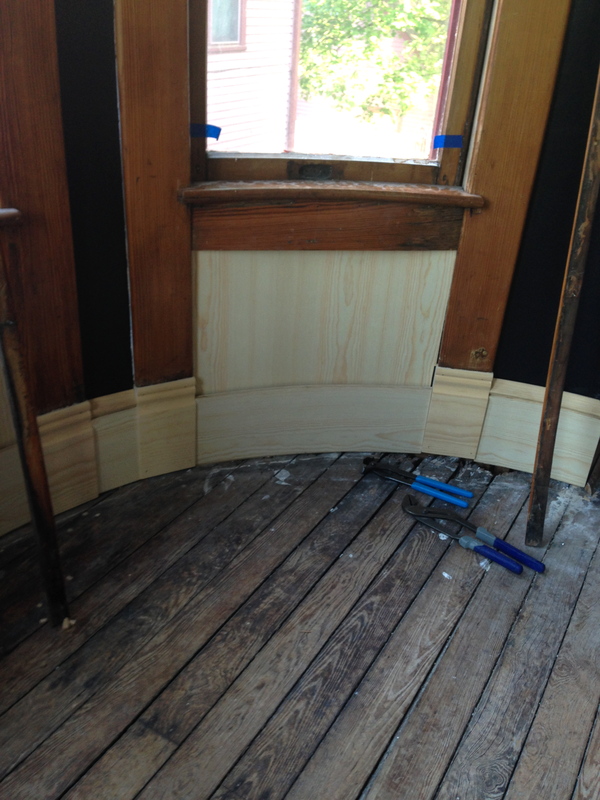 After reading your post, I kissed, praised, caressed, and blessed all the extant trim in my turret. I really like the paneling beneath the windows on the first floor in your turret. I don’t know much about turrets, but I wonder why the second floor was different. 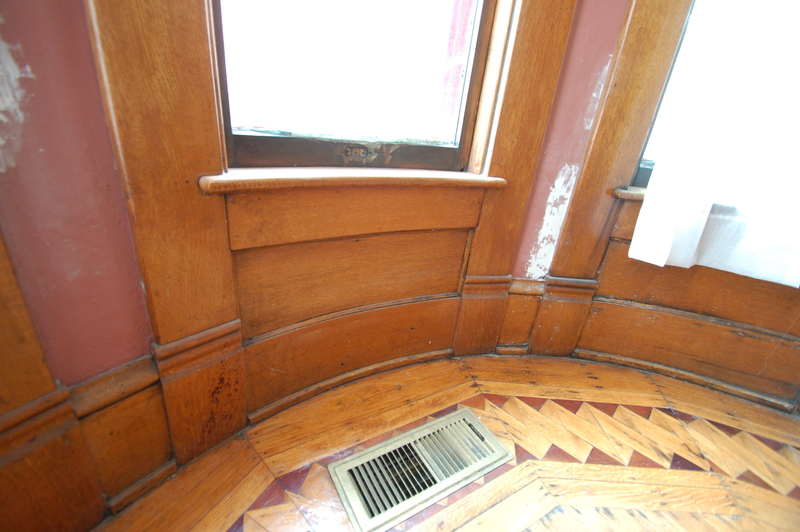 We live in a Queen Anne that was built in 1889. We don’t have a turret, but we do have two bay windows. 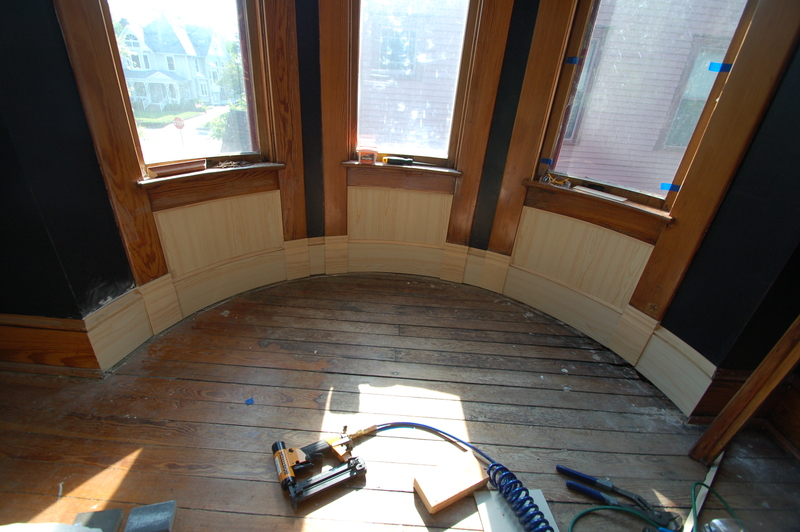 All our windows on the first and second floor are paneled between the trim piece below the window sill (what do you call that?!!) 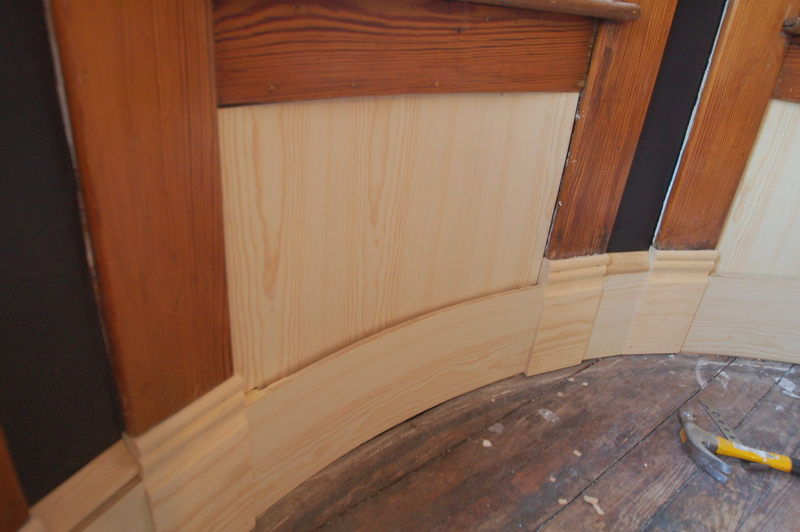 and the baseboard (except for the kitchen, bathrooms, dining room and guest suite!). 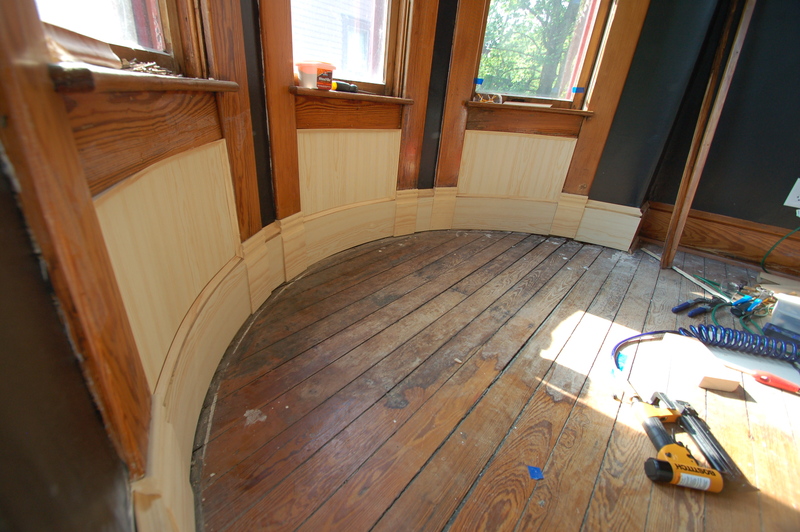 The dining room has wainscoting. I think you’ll be happy with your second floor of your turret. Everything looks so nice so far. Thanks, Lucille! I love hearing about your house. My guess is that the first floor is fancier, so that’s why it had the panelling, and the second floor didn’t. Who knows, though!